My goal this summer is to keep Peyton excited about eating her lunches. I’m hoping that if I keep it new and fun she’ll opt in for my healthy choices I’m sending with her to day camp rather than other items. This morning I decided to make her a cheese, crackers and beef stick based Bento Box. It’s a fun twist on a classic! To start out this fabulous Bento Box meal I grabbed a little cookie cutter and cut my Colby-Jack cheese slices into hearts! A fun little spin on an ordinary slice of cheese. I used 3 slices of cheese to make my hearts. Then I placed the heart-shaped cheese, crackers and beef sticks in the large well, using the crackers as a divider between the cheese and beef. Next I wanted to add some vegetables into her lunch. Peyton LOVES fresh sliced peppers, so that’s what she’s getting. I took 2 slices of red, orange and green peppers and added them to her Bento Box. A little bit of ranch dressing for dipping. While I was at the grocery store I saw they had apricots in stock, I grabbed a few to add into Peyton’s lunches. Today I sliced half an apricot to make them into little wedges. And I finished off with 2 cookies! 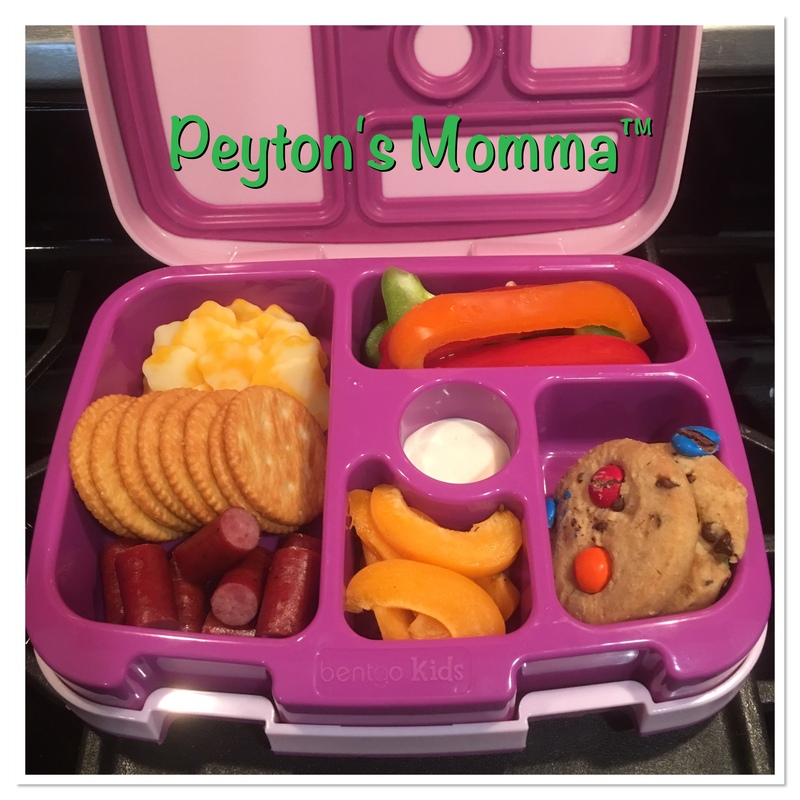 When I asked Peyton if she wanted to know what was for lunch she screamed – NO! I guess she likes being surprised when she opens her lunch. That means I’m making some great choices for her. I’m filing the Bento Box with foods I feel are nutritious and healthy for Peyton. And Peyton is enjoying the fun presentation of the food as well as the tasty goodness. It’s a win-win! Awesome lunch or snack container. They sure have changed sense the 90’s when my kids were young. This is such a nice idea in order to keep everything fresh. I appreciate the great information you have provided in this posting.